Thermaltake Big Typhoon VX: Does VX Rule Cooling? In our recent review of the Thermaltake MaxOrb and the Scythe Andy Samurai Master we evaluated whether the traditional down-facing fan coolers delivered the better performance and cooler computer systems their ads promise. Unfortunately, while both coolers performed better than the stock Intel cooler, neither came even close to cooling as well as the heatpipe towers with side-mounted fans that have topped our cooler performance tests in recent months. Both also fell short in the overclocking parameter, as neither cooler could reach higher than 3.83GHz when our top air coolers were reaching 3.90 to 3.94GHz on the same CPU. We concluded that the down-facing fan designs really did not perform as promised - at least compared to the side-fan heatpipe towers cooling a Core 2 Duo processor. Many readers requested that we test the Thermaltake Big Typhoon VX, a down-facing fan cooler with six heatpipes that has been around for a while and earned an excellent performance reputation. We really had not planned a Big Typhoon VX review since we did review the Thermaltake MaxOrb, but we are always as curious as you are whether something performs as promised. So we asked our friends at Frozen CPU for a retail Big Typhoon VX and pushed through our full suite of cooler tests. The Big Typhoon uses a multi-speed cooling fan that is very similar to the MaxOrb just tested. This should not come as a surprise since both coolers are manufactured by Thermaltake. The specified speed range, noise, and fan output range of the VX are very similar to the embedded fan on the MaxOrb. 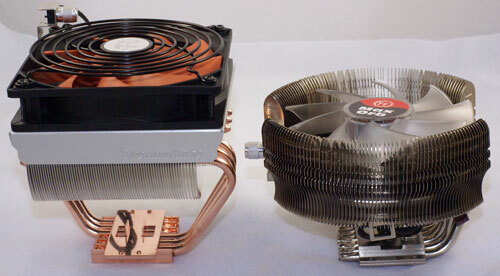 Both have a fan speed control right on the cooler, and both also have six 6mm copper heatpipes for cooling. The biggest difference between the MaxOrb and Big Typhoon VX is in size and weight. As you can see in the comparison photo the VX is massive beside the MaxOrb. What you cannot see is the large weight difference, with the Big Typhoon VX tipping the scale at 827g (2 pounds) compared to the almost svelte 465g of the MaxOrb. While design components are similar, the MaxOrb is about half the weight. The question that comes to mind is whether the larger size and greater mass will contribute to improved performance of the Big Typhoon VX? With more metal and longer heatpipes is heat better dissipated by the VX? We had also seen another roundup that placed the Big Typhoon VX at the top of the performance heap - well in front of our top-performing Thermalright Ultra-120 and Ultra-120 eXtreme. Of course that roundup did not test with the Core 2 Duo, which is the logical choice of today's overclockers. Perhaps more significant, the 86.5CFM Big Typhoon VX fan was compared to a Thermalright Ultra-120 mounting a low output (30CFM or 47CFM depending on setup) Silent fan. We were left to wonder whether more than double the airflow might have been the main contributor to the Big Typhoon victory over coolers we had found to be very capable. Our goal was to put to rest all of these questions. Using the same test bed used for our ongoing cooler tests we set out to determine whether or not the Big Typhoon VX was really the better cooler on Core 2 Duo. You people complain that having this sort of HSF is like owning stock to a big company. You guys act like Anand has done you wrong in a test of a HSF that doesn't reflect what you would do, furthermore; complaining that the results are not efficient because the lack of case fans. First off who cares, second we want to buy things that are more efficient and thats why side blown HSF are better then down blowing HSF. Conclusion is that if you have to do more to get a side HSF to work efficiently then why bother?? Why argue the points that this HSF style works far better when adequate exhaust fans are used. The comparison shows little to no difference when using side case fans to get this VX working more efficiently. I would much rather use side blown HSF and have to do less configuarations to get it to work optimaly then to use a down blowing HSF that you have to have more exhasut fans and better configurations of the case airflow. Edit, I meant to say Down blowing on this sentence but said Side. The reviews lately on the downward blowing coolers seem to imply that we only care about cooling other system components with that airflow to increase our overclock. Not so. I totally see the point the downwards-facing-coolers people are trying to make. All they're saying is that Anandtech's test-bed is unrealistic as it lacks a case exhaust fan that virtually everybody interested in this type of coolers would have installed. A backwards-facing tower cooler will tend to push the heated air out the back vent whether there's an exhaust fan there or not, since it's pointing directly at said vent in many case designs. It sort of doubles as a case fan. Meanwhile, a downwards-facing HSF will just keep recirculating the hot air. It seems that what you're saying is that cooling towers are inherently superior to the downward-blowers, since with the latter you need a case fan but you don't with the towers. I can't recall any cases I've seen in recent history where the rear of the case doesn't have perforations/fan mounts, and the fact remains that blowing air down at the motherboard is a great way to create turbulence. But hey, if you have two case fans - one at the front as intake and one at the rear as exhaust - then the downward blowing HSFs are maybe competitive with the cooling towers. Except then you have three fans instead of one or two, which almost certainly makes more noise. Wes also pointed out above that testing with four coolers didn't appreciably alter the results. The testbed is consistent and appears reasonably fair. "What if you use case X with a mod so that cooler Y blows air out the side vent that just happens to match up perfectly with motherboard Z?" Well, in that case you're probably already familiar with the setup and you just want someone to give you the thumbs up. Here you go: thumbs up! Sounds like a great setup for that particular case/HSF/mobo combination. A typical case+mobo seems a better idea as a testbed, however. Why test the most used replacement fans on the market, the Arctic Cooler Freezer 7 Pro and 64 Pro. They may not be the best cooling but they are under $20 delivered and are virtually silent.